Director of National Intelligence James Clapper, NSA Director Admiral Mike Rogers and Marcel Lettre, undersecretary of defense for intelligence, are testifying before the Senate Armed Services Committee on Russian cyberattacks during the 2016 election as well as the greater cyber threat Russia poses to the U.S.
12:10 p.m. Clapper wraps up hearing saying Congress has a “crucial responsibility” to oversee what the intelligence community does on legality, protection of civil liberties and privacy. “I think there’s a difference between oversight and micromanagement,” Clapper said. 11:58 a.m. Sen. Tim Kaine, D-Virginia, Hillary Clinton’s vice presidential running mate, brought up the Watergate scandal and that the congressional investigation that followed. “It is my hope that this Congress is willing to stand in a bipartisan way...as the Congress did in 1974,” Kaine said about inquiries into Russian hacking. He talked about how he was a victim of fake news during the election and slammed Mr. Trump’s incoming national security adviser, Michael Flynn, who has promoted some of those stories. 11:23 a.m. Sen. Dan Sullivan, R-Alaska, asks Clapper why the U.S. didn’t retaliate against China for the hack of millions of government employees’ personal information through the Office of Personnel Management. Clapper explained that the U.S. “did not retaliate against an act of espionage” any more than other countries do. Sullivan asked if the lack of U.S. action is part of the problem because it shows, “We’re not going to make it costly,” he said. “If we’re going to punish each other for acts of espionage, that’s a different policy issue,” Clapper said. 11:18 a.m. Sen. Joe Donnelly, D-Indiana, asks Clapper “how far up the chain does this go” on Russian hacking? “I can’t speak to that in this setting,” Clapper says. 10:55 a.m. Sen. Tom Cotton, R-Arkansas, asked Clapper if he could elaborate on the motive behind Russian hacking that will be included in the report prepared by the CIA, FBI and NSA that will be released to the public early next week. Clapper said that the U.S. intelligence community is “not perfect” and that it’s made up of organizations of human beings and they’re prone sometimes to making errors. He added, however, that the intelligence community doesn’t get the credit it deserves for what it does each day. 10:31 a.m. Sen. Roger Wicker, R-Mississippi asked Clapper whether President Obama’s announced sanctions last week against Russian entities and individuals involved in cyberattacks were part of his recommendations as director of national intelligence. “Without going into internal decision-making, it was a consensus inter-agency view,” Clapper said. 10:24 a.m. Sen. Bill Nelson, D-Florida, asks Clapper if the report on Russian hacking and interference next week would “ascribe a motivation” to Putin. “Yes, we will ascribe a motivation,” said Clapper, who added that he didn’t want to preempt the report. He added that they have not been in touch with the Trump transition team about its plan to overhaul the office of the Director of National Intelligence. 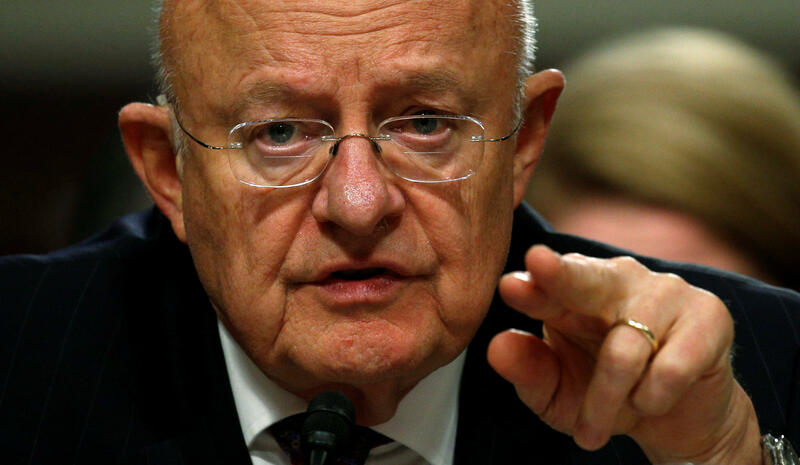 Clapper added that Russian hackers did not change any vote tallies and that the U.S. intelligence community has no way of determining the impact on the choices voters made. 9:52 a.m. Clapper begins his testimony and talks about the comprehensive report the U.S. intelligence community is preparing to release on Russian cyberattacks and interference in the 2016 election. He said that officials plan to brief Congress on the report and they will release an unclassified version to the public early next week. 9:41 a.m. Reed reiterated his desire for the creation of a special select committee that would specifically focus on Russian cyberattacks and the overall cyber threat. 9:37 a.m. McCain kicked off the hearing, which he said comes in the “aftermath of an unprecedented attack on our democracy.” He said he’s “confident” that Clapper can lead the investigation with integrity and said he’s “confident” in the U.S. intelligence community even as President-elect Donald Trump questions its findings. McCain said that the Russian cyberattacks during the election are “part of a much bigger cyber problem” and he slammed the Obama administration for having “no policy” that results in cyber deterrence. 9:30 a.m. Director of National Intelligence James Clapper, NSA Director Admiral Mike Rogers and Marcel Lettre, undersecretary of defense for intelligence, are testifying before the Senate Armed Services Committee on Russian cyberattacks during the 2016 election as well as the greater cyber threat Russia poses to the U.S.
Sen. John McCain, R-Arizona, is chairing the hearing and Sen. Jack Reed, D-Rhode Island, is the top Democrat on the panel. Some of the other members include Sens. Ted Cruz, R-Texas, Lindsey Graham, R-South Carolina and Sen. Elizabeth Warren, D-Massachusetts.